The Civitas Institute, a conservative think tank founded and bankrolled primarily by N.C. budget director Art Pope, sought funding for a campaign to portray the Medicaid public health insurance program for the poor and disabled as "failed" and to call for funding cuts. At a critical moment for the future of North Carolina's Medicaid program, a conservative think tank that was founded and is bankrolled by state budget director Art Pope sought funding for a campaign to portray the public health insurance program for the poor and disabled as "failed." The John W. Pope Civitas Institute of Raleigh, N.C. said the success of its campaign would "be determined by a reduction in Medicaid funding." It also said it planned to share its "messaging strategies" with fellow members of the State Policy Network, a national alliance of conservative think tanks that get substantial funding from corporate interests. SPN has come under scrutiny recently for its role in driving the conservative agenda in statehouses nationwide while reporting little to no lobbying activity. 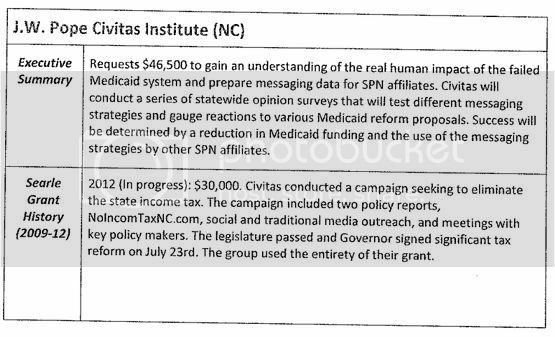 Civitas' plans for an anti-Medicaid campaign came to light through leaked documents that the British newspaper The Guardian obtained from the American Legislative Exchange Council (ALEC), a controversial group that brings together conservative state lawmakers and corporations to promote business-friendly legislation and that works closely with SPN. The campaign was first reported on last week by Media Matters for America, a progressive nonprofit that monitors conservative groups. Incorporated in 2005 and named for Pope's father, Civitas historically has gotten over 90 percent of its money from Pope's family foundation, which in turn is funded by the wealth from his Variety Wholesalers discount retail chain. Civitas is so reliant on Pope's money that the IRS classifies it as a "private foundation," a designation for nonprofits that rely on a sole benefactor. Pope served on the Civitas board until last December, stepping down after he was appointed state budget director by Gov. Pat McCrory (R). Civitas has long targeted Medicaid for budget cuts, decrying as "frills" optional services provided by the state's program including prescription drugs, mental health care, and physical therapy. The leaked documents show that SPN gathered grant proposals from member groups in 34 states on July 29 and submitted them for funding to the Searle Freedom Trust, a private foundation built on the wealth inherited from pharmaceutical giant G.D. Searle & Co., now a Pfizer subsidiary. Daniel C. Searle formed the trust in 1988 to promote "free enterprise conservative" ideas. Among the other groups it funds are ALEC, Americans for Prosperity, and the American Enterprise Institute. Civitas' message that Medicaid has "failed" echoes the McCrory administration's oft-repeated charge that North Carolina's Medicaid system is "broken" -- even though audits, reports and awards suggest the allegation is hyperbole. Earlier this year, Gov. McCrory cited Medicaid's supposed brokenness to reject the option of expanding the program to more low-income people under the Affordable Care Act. The recession has led to a sharp decline in the percentage of North Carolina residents with employer-sponsored insurance, from 69 percent in 2000 to 56 percent in 2011. Today about 1.5 million North Carolinians are uninsured -- nearly 20 percent of the state's residents. The Medicaid expansion would have covered about 500,000 of them. Activists with the NAACP-led Moral Monday movement -- which has also been a target of Civitas -- are asking McCrory to convene as "Special Redemption Session" of the legislature to revisit the matter. However, McCrory has said such a session is "out of the question." The effort to paint Medicaid as broken has coincided with McCrory's controversial quest to "reform" the program, by which he means shifting Medicaid away from the current community-based system run by a nonprofit agency to a privatized managed care model. The budget passed this year by the Republican supermajority-controlled state legislature -- elected with the generous support of Pope -- directed McCrory to create a Medicaid Reform Advisory Group to advise the state Department of Health and Human Services as it develops a plan to remodel the program. North Carolina Health News, a nonprofit journalism organization that has provided in-depth coverage of the controversies surrounding the state Medicaid program, including the McCrory administration's bungling of a new billing system, reported recently that managed care companies are "aggressively making overtures to health care providers throughout the state, hiring lobbyists and setting up offices in Raleigh" in an effort to press for privatization. The shift to private Medicaid plans has led to problems in other states such as Florida, where patients' advocates cited serious problems with a pilot privatization program and called for close monitoring of companies to ensure they don't withhold care. In Louisiana, the shift to Medicaid managed care has raised concerns about doctors improperly steering patients into particular plans. The Guardian reports that it's unknown how many of the proposals the SPN submitted to the Searle Freedom Trust were funded, or which were successful. But since the proposals were submitted to the foundation in July, Civitas has kept up a steady drumbeat of Medicaid criticism, posting entries to its website that take the program to task for cost overruns while touting the privatization plan. Civitas was particularly incensed by North Carolina Health News' critical investigation into the McCrory administration's claims that the state's Medicaid program is "broken" while suppressing information that would have portrayed it in a more positive light. "Hidden agendas can be dangerous," Civitas President Francis X. De Luca wrote, "particularly when the goal is to influence public opinion with political attacks in the guise of impartial journalism."